There are very few things that are worse than going to put on your favorite white shirt in the morning, only to notice the ugly deodorant stains that have rendered it unwearable. Unfortunately, deodorant and antiperspirant can build-up on your shirts over time, leaving your shirts to develop a thick and crusty stain that can be hard to remove. 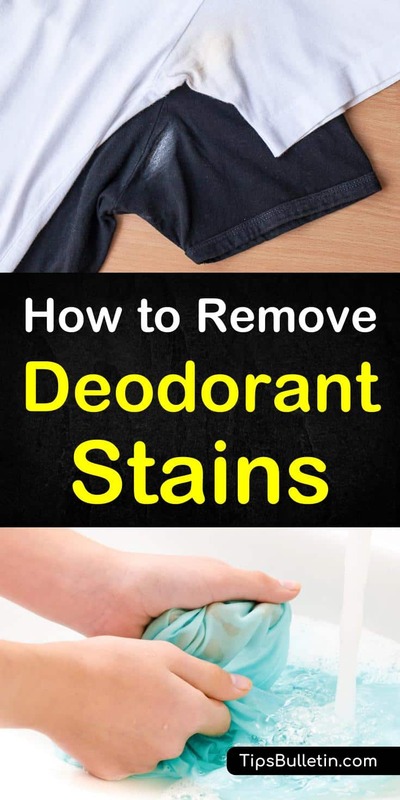 The good news is that those ugly deodorant stains are easy to get out of your clothing once you learn how to remove deodorant stains out of garments. Deodorants are designed to work on the odors that are caused by sweating. For this to be accomplished, the manufacturers of antiperspirants and deodorants add aluminum salts to the products. The aluminum reacts with the salts in your sweat, causing the fabric to yellow. 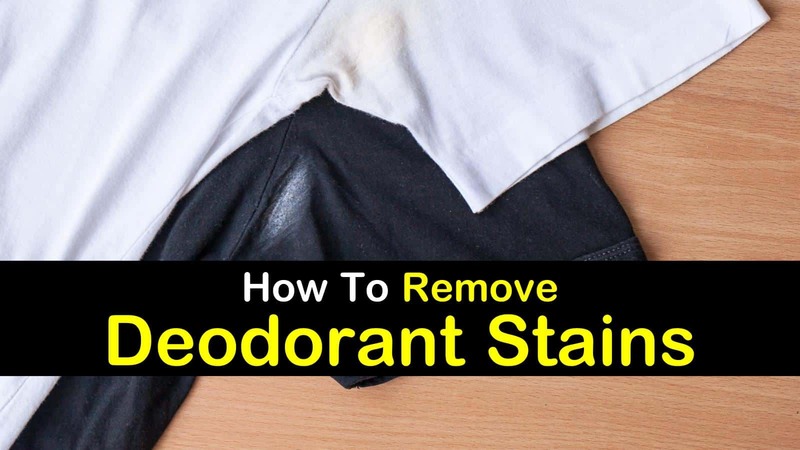 Luckily, you don’t need to throw your clothes away because of underarm deodorant stains, with the following tips and tricks you can start removing deodorant stains from your clothes today. The chemicals that are found in deodorants and antiperspirants not only react with the salts in your sweat, but they can cause a reaction with the fabric softener you use in your washer or dryer. This reaction can create even more discoloring on your favorite shirts. This can leave you wondering how to get rid of deodorant stains from your favorite shirts. The following techniques will effectively remove deodorant stains from your favorite clothing. Lemon juice contains natural bleaching properties, and when combined with the sun it can help antiperspirant stains to fade from light-colored clothing. Lemon also has fantastic cleaning powers due to the low pH levels and high levels of citric acid. Pour the lemon juice into a small cup or bowl. Soak the stained area of your shirt in the lemon juice until it is saturated completely. Place the garment in the sun for 15 minutes. Sprinkle the table salt on the stain and rub gently into the stain with a cleaning brush. Rinse the area with cold water and set in the sun to dry. If there isn’t any sun out, toss the clothing in the laundry and wash as usual. When mixed with water, baking soda effervesces, allowing it to lift any deposits from the fabric. Baking soda is also extremely absorbent, which helps it to soak up most of the residue from the clothing. This technique is especially useful for removing dried, yellowish stains caused by antiperspirant. Combine the baking soda and water, mixing to form a thick paste. Liberally spread the paste over the stain. Allow the paste to stand for at least 30 minutes. Using a cleaning brush, gently rub the baking soda to agitate the cleaning process. To remove any residue from the clothing, rinse with water. You can use your liquid laundry detergent as a spot treatment to remove deodorant stains from most fabrics. When you mix the laundry detergent with water, the carbonation helps to break down the deposits that are responsible for creating the stain in the first place. Combine the water and the laundry detergent and mix well to create the cleaning solution. Place the garment in the solution and allow to soak for 30 minutes. Using your hands, gently rub the stained area back and forth, to quickly remove the stain. Rinse the clothing and set in the sun to dry. Finding out that you have underarm deodorant stains on your black T-shirt can be a bit embarrassing. The thick layer of caked-on, whitish residue is typically from using an excessive amount of deodorant that can quickly build up. These wax-like stains can slowly transfer to your clothing and are difficult to remove even after being thoroughly washed. Learn how to get deodorant stains out of a black dress and all your favorite black garments. We also cover the topic of washing black shirts in a special laundry tip on how to wash dark clothes. The chemicals contained in deodorant can leave mineral and oil deposits on the underarms of all your favorite shirts. The acidic properties of distilled white vinegar will help to break down these oils and minerals that have caused the satin, thus eliminating the stain. Dilute the vinegar by mixing it with the water. Place the stained area of the garment in the diluted vinegar and let soak for at least 30 minutes. Remove from the vinegar solution and gently rub the stain to remove any of the stains that remain. Rinse the vinegar out of the fabric with water. Rubbing alcohol is excellent for dissolving the mineral and oil deposits that are transferred to your clothing from deodorant. The great thing about using rubbing alcohol to get rid of deodorant stains is that it is a single-step treatment method. Here’s how to get rid of deodorant stains under armpits with rubbing alcohol. All you need to do is saturate a cotton ball with the rubbing alcohol and gently rub the cotton ball over the stain. >> Extra Tip: Use rubbing alcohol when you are not sure how to remove lipstick from your clothes. Hydrogen peroxide is a natural bleaching agent and is excellent at absorbing odors. Just a little bit of a hydrogen peroxide solution will work wonders to lighten and remove ugly white marks that are caused by deodorant. In a small bowl, mix the hydrogen peroxide and dish soap. Mix thoroughly to combine. Soak the deodorant stain in the solution for 30 minutes. Remove from the solution and gently work the solution into the stained fabric. Rinse thoroughly with warm water and allow to dry in the sun. Never let those unsightly deodorant stains embarrass you again. Use these practical techniques to thoroughly remove even the toughest deodorant stains from all your favorite clothes for good. If you enjoyed learning how to get deodorant stains out of clothes, please feel free to share these laundry tips with all your friends and family.